MyMemories Blog: Meet this week's Featured Designer!! It's *Digi-Cyber Scraps*!! Meet this week's Featured Designer!! It's *Digi-Cyber Scraps*!! I'm the mother of two grown children (ages 23 and 21) and the wife of a pastor in Brooklyn, NY. I'm a craft lover (basically I enjoy about every craft I've ever done) and love working at the computer. I was introduced to digital scrapbooking by a pastor's wife friend, who did phenomenal pages, and just knew that it would be something that I enjoyed. And I was right! It just made sense to me since all of my pictures are digital anyway. I can't even remember how long I've been digital scrapbooking, but it's been a blast! I even got my daughter hooked and she, too, has become a MyMemories software user! I started designing because I wanted to scrap my own pictures and couldn't find what I was looking for in the colors that I wanted. Even if I had been able to find them, our budget was tight and didn't allow for many purchases. I figured that I could just design my own. Thanks to all the tutorial writers online, I was able to learn the basics of designing and the rest, as they say, is history! I've been a designer with MyMemories for just a little over a year and it has been the best year!! I'm looking forward to many more years of designing and scrapping with MyMemories!! We are excited to share some FUN stuff she has on sale this week!! Check out these kits to get a jump on your winter and holiday scrapping! And... to get to the good stuff - here are the PRIZES she's got for a few Lucky Ducks this week!! Be sure to comment below and tell her YOUR favorite kit from the list above!! Winners will be posted next Monday! 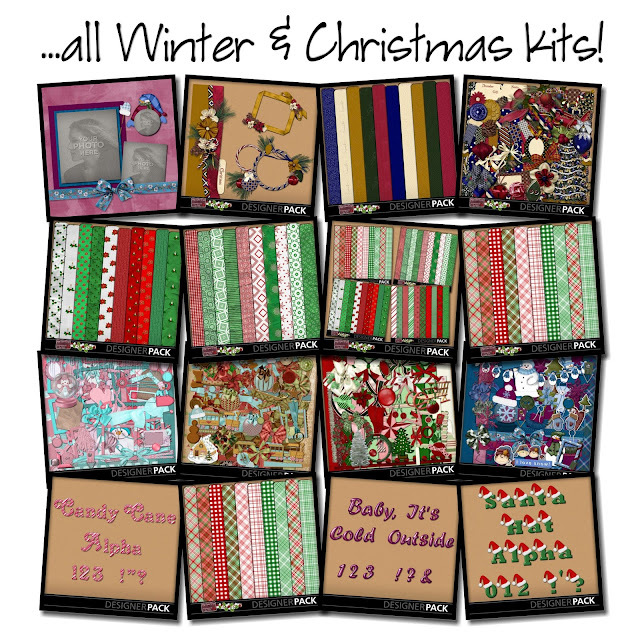 Don't miss a chance to add some COOL kits to your stash! And check out her other places too - Designers often add some fun things to their blog and FB page and you don't want to miss a single thing! Ohh wow what a fantastic giveaway. Tis the Season kit is my fav, well one of them. Thanks for the awesome giveaway! my favorite is Gingerbread Christmas! thanks for the chance! I love Frosty Days! I'm a sucker for the pastel Christmas decor. Thanks for the awesome giveaways! Oh my gosh, I just won the MyMemories Version 4 and am sooooo excited. I think I am on overload right now. Can't wait to figure this out and blog about it but...I so love all of the Christmas kits you have but the Gingerbread one is my favorite. Thanks for this opportunity. God's Fall Paintbox Collection is so beautiful and versatile. can't get enough background papers so my favorite among the list is Christmas Backgrounds Bundle Pack. Love the colors in Baby It's Cold Outside kit. Thanks for the chance!